Continue your patients' care and give them an excellent experience as their vision evolves into presbyopia with 1-DAY ACUVUE® MOIST MULTIFOCAL, the multifocal lenses that provide balanced vision at all distances, allowing your patients to keep the lenses they love as the years advance. Furthermore, 1-DAY ACUVUE® MOIST MULTIFOCAL provides presbyopic patients with extra care to help minimise contact lens-related dryness2-5. Built with EYE-INSPIRED™ Design, 1-DAY ACUVUE® MOIST MULTIFOCAL Contact Lenses offer more than just vision correction. Up to 4 lenses total. JJVC Data on file 2009. Post-hoc analysis October 2009. Among adults aged 25–34 (n=71) P<0.05. With 1-DAY ACUVUE® MOIST®, 1% of patients experience frequent eye irritation, 14% of wearers occasionally experience eye irritation while 83% seldom or never experienced eye irritation. Sheardown H et al. Invest Ophthalmol Vis Sci 2006;47 [E-Abstract 2388]. JJVC data on file 2005. JJVC data on file 2007. JJVC data on file 2009. 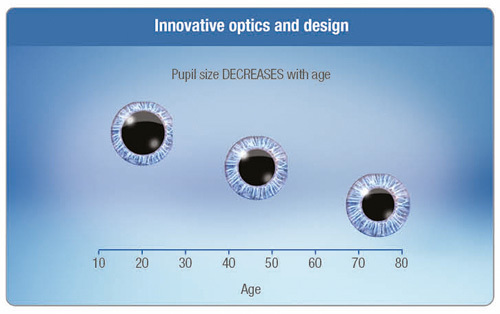 Post-hoc analysis, October 2009; adults aged 25–34 years (n=71); with 1-DAY ACUVUE® MOIST, 1% of patients experience frequent eye irritation, 14% of wearers occasionally experience eye irritation, while 83% seldom or never experienced eye irritation. Moody K, Hickson-Curran S, Wooley B, Ruston D Innovating for multifocal fitting success Optician 03.07.15 P12-17. JJVC 2015 Independent 3rd party data. Sheardown H et al. 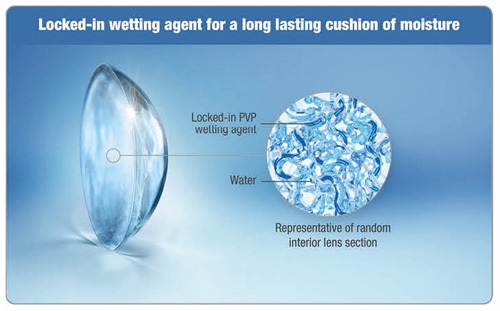 Chemical characterization of 1-DAY ACUVUE® MOIST® and 1-DAY ACUVUE® Contact Lenses. Invest Ophthalmol Vis Sci 2006;47: E-Abstract 2388. JJVC Data on file 2005 and 2007. JJVC Data on file 2014. Data generated in collaboration with the Centre for Contact Lens Research (CCLR) in Waterloo, Canada. Suwala M et al. Quantity and conformation of lysozyme deposited on conventional and silicone hydrogel contact lens materials using an in vitro model. Eye Contact Lens, 2007; 33, 138–143. Always start with a new subjective refraction, push the maximum plus for distance, and determine the spherical equivalent. Apply vertex distance correction if greater than 1.00 DC. 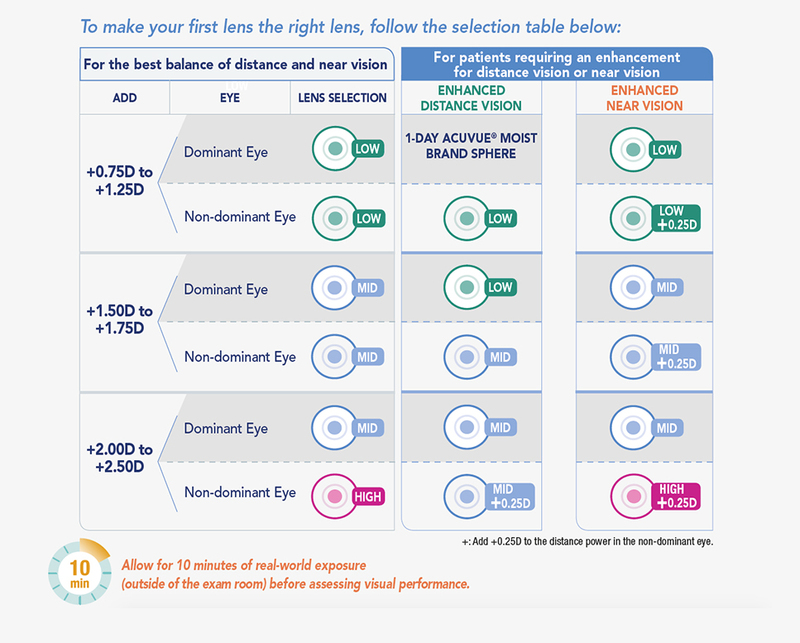 Ensure that astigmatism is less than +/-4.00DS. ‡Units: x 10-11 (cm2/sec) (ml O2 /ml x mm Hg) @35oC Fatt (boundary corrected, non-edge corrected). † All ACUVUE® Brand Contact Lenses have Class 1 or Class 2 UV-blocking to help provide protection against transmission of harmful UV radiation to the cornea and into the eye. 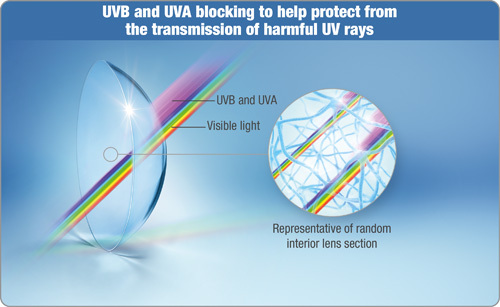 UV-absorbing contact lenses are NOT substitutes for protective UV-absorbing eyewear such as UV-absorbing goggles or sunglasses because they do not completely cover the eye and surrounding area. UV transmission measured with -1.00D lens. ACUVUE® and 1-DAY ACUVUE® MOIST MULTIFOCAL are trademarks of Johnson & Johnson Medical Ltd. © Johnson & Johnson Medical Ltd. 2015.